The introduction (nos. 1-7) of LF illustrates the motivations at the basis of the document: firstly, it reiterates the characteristics of light typical of faith, able to illuminate all man’s existence, to assist him in distinguishing good from evil, especially in this modern age in which belief is opposed to searching and faith is regarded as an illusion, a leap into the void that impedes man’s freedom. Secondly, LF – precisely in this Year of Faith, 50 years following the Second Vatican Council, a “Council on faith” – seeks to reinvigorate the perception of the breadth of the horizons faith opens so that it might be confessed in unity and integrity. Indeed, faith is not a condition to be taken for granted, but rather a gift from God, to be nurtured and reinforced. “Who believes, sees,” the Pope writes, since the light of faith comes from God and is able to illuminate all aspects of man’s existence: it proceeds from the past, from the memory of Jesus’ life, but also comes from the future as it opens up vast horizons. Chapter One (nos. 8-22): We have believed in love (1 John 4: 16). Referring to the biblical figure of Abraham, in this chapter faith is explained as “listening” to the word of God, the “call” to come out from the isolated self in order to open oneself to a new life and the “promise” of the future, which makes possible the continuity of our path through time, linked so closely to hope. Faith also has a connotation of “paternity”, because the God who calls us is not a stranger, but is God the Father, the wellspring of the goodness that is at the origin of and sustains everything. In the history of Israel, faith is opposed to idolatry, which man is broken down in the multiplicity of his desires and “his life story disintegrates into a myriad of unconnected instants”, denying him the time to await the fulfillment of the promise. On the contrary, faith is trust in God’s merciful love, which always welcomes and forgives, and which straightens “the crooked lines of our history”; it is the willingness to allow oneself to be transformed anew by “God’s free gift, which calls for humility and the courage to trust and to entrust; it enables us to see the luminous path leading to the encounter of God and humanity, the history of salvation” (no. 14). And herein lies the “paradox” of faith: constantly turning to the Lord gives humanity stability, liberating us from idols. LF then turns to the figure of Jesus, the mediator who opens to us to a truth greater than ourselves, the manifestation of God’s love that is the foundation of faith: “in contemplating Jesus’ death … faith grows stronger”, as in this He reveals His unshakeable love for mankind. His resurrection renders Christ a “trustworthy witness”, “deserving of faith”, through Whom God works truly throughout history, determining its final destiny. But there is a “decisive aspect” of faith in Jesus: “participation in His way of seeing”. Faith, indeed, looks not only to Jesus but also from Jesus’ point of view, with His eyes. 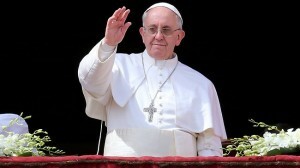 The Pope uses an analogy to explain that, just as how in our daily lives we place our trust in “others who know better than we do” – the architect, the pharmacist, the lawyer – also for faith we need someone who is reliable and expert “where God is concerned” and Jesus is “the one who makes God known to us”. Therefore, we believe Jesus when we accept his Word, and we believe in Jesus when we welcome Him in our life and entrust ourselves to Him. Indeed, his incarnation ensures that faith does not separate us from reality, but rather helps us to grasp its deepest meaning. Thanks to faith, man saves himself, as he opens himself to a Love that precedes and transforms him from within. And this is the true action of the Holy Spirit: “The Christian can see with the eyes of Jesus and share in His mind, His filial disposition, because he or she shares in his love, which is the Spirit” (no.21). Without the presence of the Spirit it is impossible to confess the Lord. Therefore “the life of the believer becomes an ecclesial existence”, since faith is confessed within the body of the Church, as the “concrete communion of believers”. Christians are “one” without losing their individuality and in the service of others they come into their own. Thus, “faith is not a private matter, a completely individualistic notion or a personal opinion”, but rather “it comes from hearing, and is meant to find expression in words and to be proclaimed”. Chapter Two (nos. 23-36): Unless you believe, you will not understand (Isaiah 7:9). The Pope shows the close link between faith and truth, the reliable truth of God, His faithful presence throughout history. “Faith without truth does not save”, writes the Pope; “It remains a beautiful story, the projection of our deep yearning for happiness.” And nowadays, given “the crisis of truth in our age,” it is more necessary than ever before to recall this link, as contemporary culture tends to accept only the truth of technology, what man manages to build and measure through science, truth that “works,” or rather the single truths valid only for the individual and not in the service of the common good. Today we regard with suspicion the “Truth itself, the truth which would comprehensively explain our life as individuals and in society”, as it is erroneously associated with the truths claimed by twentieth-century forms of totalitarianism. However, this leads to a “massive amnesia in our contemporary world” which – to the advantage of relativism and in fear of fanaticism – forgets this question of truth, of the origin of all – the question of God. LF then underlines the link between faith and love, understood not as “an ephemeral emotion”, but as God’s great love which transforms us within and grants us new eyes with which we may see reality. If, therefore, faith is linked to truth and love, then “love and truth are inseparable”, because only true love withstands the test of time and becomes the source of knowledge. And since the knowledge of faith is born of God’s faithful love, “truth and fidelity go together”. The truth that discloses faith is a truth centred on the encounter with Christ incarnate, Who, coming among us, has touched us and granted us His grace, transforming our hearts. There is, however, “a special means” by which faith may be transmitted: the Sacraments, in which an “incarnate memory” is communicated. The Pope first mentions Baptism – both of children and adults, in the form of the catechumenate – which reminds us that faith is not the work of an isolated individual, an act that may be carried out alone, but instead must be received, in ecclesial communion. “No-one baptizes himself”, explains LF. Furthermore, since the baptized child cannot confess the faith himself but must instead be supported by parents and godparents, the “cooperation between Church and family” is important. Secondly, the Encyclical refers to the Eucharist, “precious nourishment for faith”, an “act of remembrance, a making present of the mystery”, which “leads from the visible world to the invisible”, teaching us to experience the depth of reality. The Pope then considers the confession of the faith, the Creed, in which the believer not only confesses faith but is involved in the truth that he confesses; prayer, Our Father, by which the Christian learns to see through Christ’s eyes; the Decalogue, understood not as “a set of negative commands” but rather as “concrete directions” to enter into dialogue with God, “to be embraced by His mercy”, the “path of gratitude” towards the fullness of communion with God. Finally, the Pope underlines the there is one faith because of the “oneness of the God who is known and confessed”, because it is directed towards the one Lord, who grants us “a common gaze” and “is shared by the whole Church, which is one body and one Spirit”. Therefore, given that there is one faith alone, it follows that is must be confessed in all its purity and integrity: “the unity of faith is the unity of the Church”; to subtract something from faith is to subtract something from the veracity of communion. Furthermore, since the unity of faith is that of a living organism, it is able to assimilate all it encounters, demonstrating itself to be universal, catholic, illuminating and able to lead all the cosmos and all history to its finest expression. This unity is guaranteed by the apostolic succession. Fourth chapter (nos. 50-60): God prepares a city for them (Hebrews 11:16) This chapter explains the link between faith and the common good, which leads to the creation of a place in which men and women may live together with others. Faith, which is born of the love of God, strengthens the bonds of humanity and places itself at the service of justice, rights and peace. This is why it does not distance itself from the world and is not unrelated to the real commitments of contemporary man. On the contrary, without the love of God in which we can place our trust, the bonds between people would be based only on utility, interests and fear. Instead faith grasps the deepest foundation of human relationships, their definitive destiny in God, and places them at the service of the common good. Faith “is for all, it is a common good”; its purpose is not merely to build the hereafter but to help in edifying our societies in order that they may proceed together towards a future of hope. The Encyclical then considers those areas illuminated by faith: first and foremost, the family based on marriage, understood as a stable union between man and woman. This is born of the recognition and acceptance of the goodness of sexual differentiation and, based on love in Christ, promises “a love for ever” and recognizes love as the creator that leads to the begetting of children. Then, youth; here the Pope cites the World Youth Days, in which young people demonstrate “the joy of faith” and their commitment to live faith solidly and generously. “Young people want to live life to the fullest”, writes the Pope. “Encountering Christ … enlarges the horizons of existence, gives it a firm hope which will not disappoint. Faith is no refuge for the fainthearted, but something which enhances our lives”. And again, in all social relations, by making us children of God, indeed, faith gives new meaning to universal brotherhood, which is not merely equality, but rather the common experience of God’s paternity, the comprehension of the unique dignity of each person. A further area is that of nature: faith helps us to respect it, to “find models of development which are based not simply on utility and profit, but consider creation as a gift”. It teaches us to find just forms of government, in which authority comes from God and which serve the common good; it offers us the possibility of forgiveness that leads us to overcome all conflict. “When faith is weakened, the foundations of humanity also risk being weakened”, writes the Pope, and if we remove faith in God from our cities, we will lose our mutual trust and be united only by fear. Therefore we must not be ashamed to publicly confess God, because faith illuminates social life. Another area illuminated by faith is that of suffering and death: Christians are aware that suffering cannot be eliminated, but it may be given meaning; it can be entrusted to the hands of God who never abandons us and therefore become “a moment of growth in faith”. To he who suffers, God does not give reasons to explain everything, but rather offers His presence that accompanies us, that opens up a threshold of light in the shadows. In this sense, faith is linked to hope. And here the Pope makes an appeal: “Let us refuse to be robbed of hope, or to allow our hope to be dimmed by facile answers and solutions which block our progress”. Conclusion (nos. 58-60): Blessed are you who believed (Luke 1,45) At the end of LF, the Pope invites us to look to Mary, “perfect icon” of faith who, as the Mother of Jesus, conceived “faith and joy”. The Pope elevates his prayer to Maria that she might assist man in his faith, to remind us those who believe are never alone and to teach us to see through Jesus’ eyes.